If you are interested in volunteering or interning with the Dr. Martin Luther King Jr. Initiative, please contact Bart Schultz, the Executive Director of the Civic Knowledge Project, at rschultz@uchicago.edu. If you have used the Pathfinder system, please indicate which job description you are interested in. Click here for a complete schedule of MLK Initiative events both past and present. And please check out the leading partner in the MLK Initiative, the RainbowPUSH Coalition! 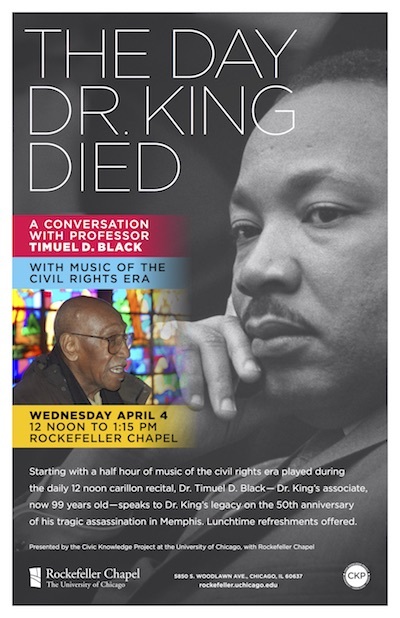 [Video] "The Day Dr. King Died," a conversation between CKP Director Bart Schultz and civil rights legend Prof. Timuel D. Black to commemorate the 50th anniversary of Dr. King's tragic assassination. Prof. Timuel D. Black and Rev. 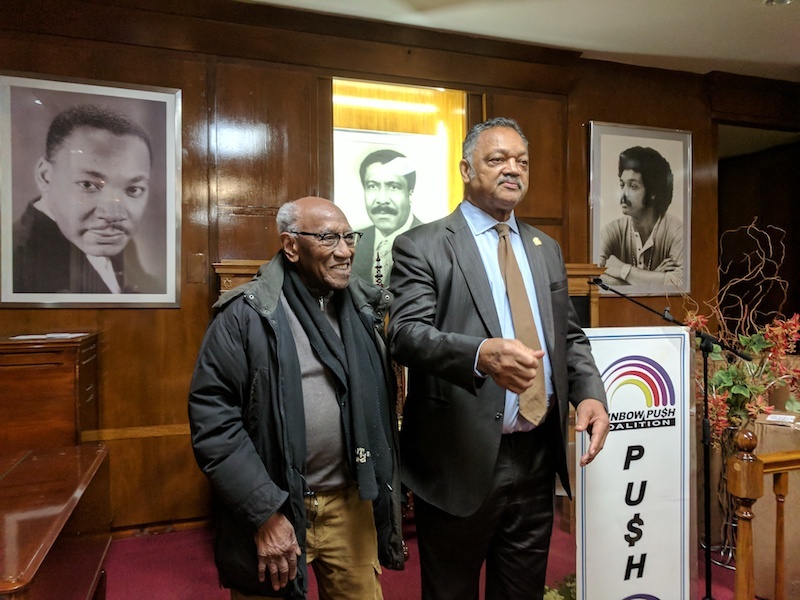 Jesse Jackson Sr. The Civic Knowledge Project has for many years been deeply devoted to studying and celebrating the legacy of Dr. Martin Luther King Jr. Working closely with Chicago’s South Side legend, the great civil rights activist and oral historian Timuel D. Black, who worked directly with Dr. King and helped organize the March on Washington, the CKP has initiated and supported a wide range of projects designed to research the roots of Dr. King’s philosophy of nonviolence and his role in the civil rights movement, and to call attention to the ongoing relevance of his life and work, with a special emphasis on his connections to the City of Chicago. “Civic Knowledge,” in Chicago, ought to accord a special and prominent place to the legacy of Dr. Martin Luther King Jr., who brought his movement here in 1966. The new MLK Initiative will work with a wide range of community partners--including the RainbowPUSH Coalition and Liberty Baptist Church--as well as various UChicago partners--including the Center for the Study of Race, Politics, and Culture, the Office of Civic Engagement, the Alumni Association and Rockefeller Chapel--to commemorate the work of Dr. King on the occasion of the 50th Anniversary of his tragic assassination. This Initiative will involve a wide range of educational programs and activist opportunities designed to showcase and critically assess the ongoing importance of King's philosophy of nonviolence. 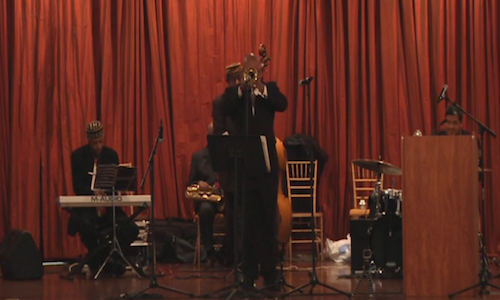 Check out some of the MLK Initiative's Home Movies here, or on our Media Page. 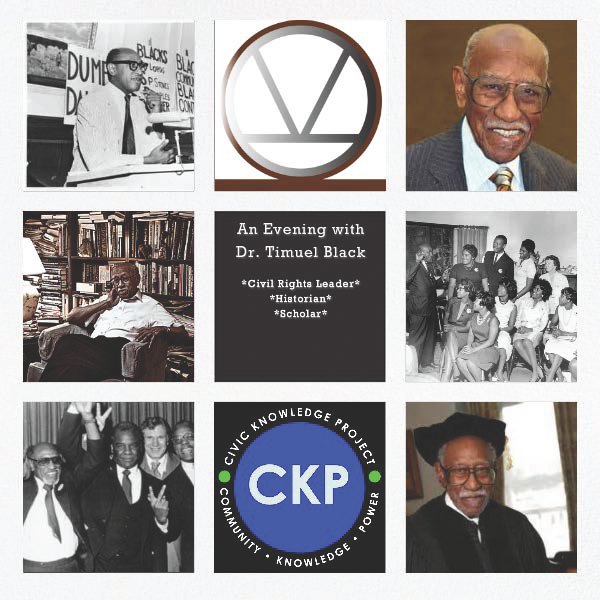 Please do check out this wonderful story about our great CKP friend and supporter, Timuel D. Black, who was featured on the UChicago homepage: A Lifetime Championing Civil Rights. All of us at the CKP take great pride in having helped build this relationship between UChicago and Prof. Black, with whom we began working over a decade ago. He is the living memory of the South Side of Chicago.